Siamese kittens for adoption – where can you find them? Several readers have asked how to find Siamese kittens for adoption, so here are some thoughts and tips on adopting a kitten and where to find your nearest rescue centers. Many people would prefer to adopt a kitten rather than an older cat for the simple pleasure of knowing it from an early age and watching it grow up. And kittens are just s-o-o-o cute! But it's their very cuteness that makes it hard to find kittens for adoption, as people are much more likely to want to adopt a kitten rather than an older cat. This is even more so with Siamese cats. In need of a good home? Pedigree kittens are expensive, which makes it very likely that the people who buy them won't want to part with them, which in turn means that fewer of them will end up in pet shelters. Breeders like to check that their cats have gone to good homes, too, and tend to keep in contact with the people who buy their babies. If, for one reason or another, a purchaser no longer wants the kitten they've bought, the breeder may take back a cat that they've bred themselves rather than risk adoption by someone unsuitable. All of this makes pedigree kittens for adoption quite scarce, and finding them rather a challenge. So what can you do if you really want to adopt a Siamese kitten? Well, there are several things you could try. The first place to get in touch with is your nearest Siamese Rescue. You can find a list of some of these on our Siamese cat rescue centers page (the link's at the bottom of this page) and if you know of any others, I'd be pleased to hear about them. If you're lucky, they may have a kitten or two needing a good home, and if they haven't, at least you've made contact. Leave your name and contact details with the rescue center, and stress that you're interested in adopting a kitten. Develop a relationship with the center. Kittens tend to find new homes very quickly, and it will help the center to know that you're actively looking. That way, you'll be at the top of their list of people to contact when they do get a kitten in. And while they may not have exactly what you're looking for right now, they often have young adult cats that you could see and consider. The next places to try are your local animal shelters. Although these tend to pass pedigree cats and kittens on to their nearest pedigree rescue centers, it can't hurt to keep in contact, as they may also have Siamese kittens for adoption from time to time. Get to know the breeders in your area. Breeders will, of course, want to sell any kittens they've bred. Breeding pedigree kittens is an expensive business, which is why the kittens cost so much. But as noted above, they do sometimes take back young cats that are no longer wanted. They may be prepared to sell these at a discounted price to someone who will guarantee to give the cat a good home. 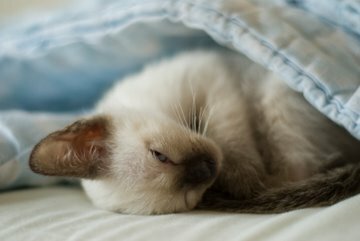 For a list of things to thing about before adopting either a cat or kitten, this page is all about Siamese cat adoption. It tells you what you'll need to consider, as well as what a rescue center will want to know from you. Finding Siamese kittens for adoption isn't easy, but persistence pays. Keep looking around. And perhaps, if you're really lucky, you might find that a Siamese kitten adopts you. Siamese Rescue - why not consider an older cat?